The Python Cookbook is a collection of problems, solutions, and practical examples for Python programmers, written by Python programmers. It contains over two hundred recipes for text manipulation, object oriented programming, XML processing, system administration, and much more. This book is a treasure trove of useful code for both novices and advanced practitioners, with contributions from such Python luminaries as Guido Van Rossum, Tim Peters, Paul Prescod, and Mark Hammond. This book is not a typical O'Reilly book, written as a cohesive manuscript by one or two authors. Instead, it is a new kind of book a first, bold attempt at applying some principles of open source development to book authoring. 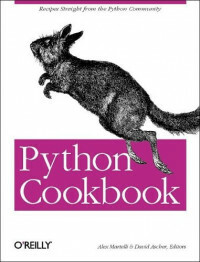 About 200 members of the Python community contributed recipes to this book. In this Preface, we, the editors, want to give you, the reader, some background regarding how this book came about and the processes and people involved, and some thoughts about the implications of this new form.